In the case of long lasting roofing materials such as slate, the weakest point inevitably ends up being the roofs flashing’s. 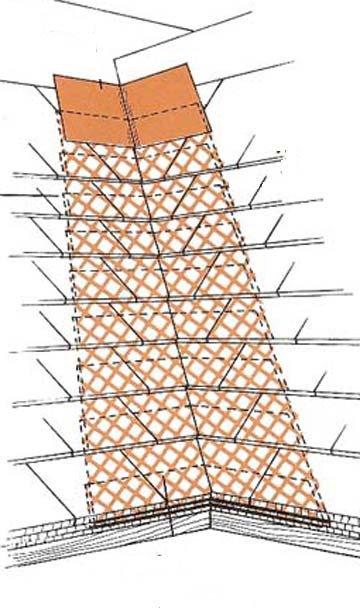 Flashing’s are the material used as a layer of protection between roof connections and projections such as chimneys, dormer walls, and valleys. Copper is by far the best material for flashing a roof. 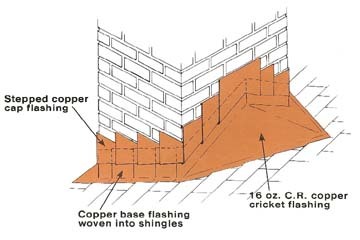 Copper Flashing’s will last on average between 80-100 years. Other Flashing materials such as the Tins commonly employed by “bargain” roofing contractors require periodic painting and must be sealed using caulking. These caulking’s wear out and the periodic painting that these flashing’s require often gets overlooked. Copper on the other hand can be soldered, creating a truly water tight seal. 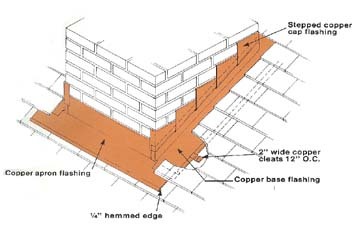 In addition Copper should be used near any masonry structures because other metals will corrode over time being in contact with mortar. When flashing’s begin to fail on a slate roof that is made of sound slate, only the flashing’s should be replaced, not the entire roof. This is routine work for slate roof restoration professionals. One of the extraordinary characteristics of slate roofs is that they can be taken apart and put back together. Broken slates, worn flashing’s, rotted sheathing boards, or any element of the roof can be removed and replaced without the need to replace the entire roof. Because of this unusual maintenance characteristic, slate roofs can be made to last as long as the slate itself will last, which could be hundreds of years. 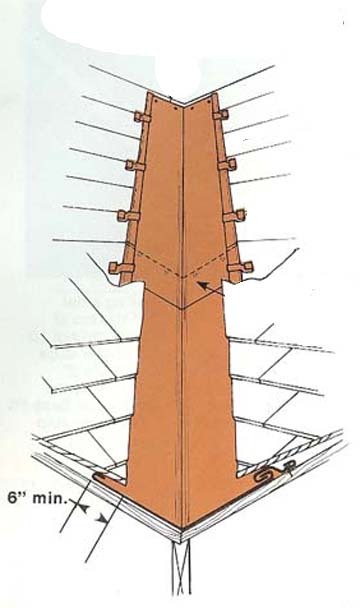 Below are diagrams explaining the proper installation of Chimney Flashings. 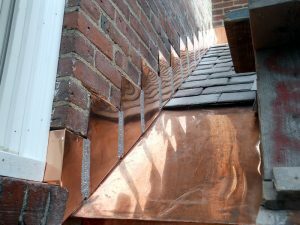 This installation invloves new base and cap flashings, including new copper aprons, new copper step flashings at the sides of the chimney, and new lead counter flashing. Valley Flashings are a common target for unqualified craftsmanship. Often, on an old roof that has failing flashings, the valleys are the first point for leaks to become noticeable. This is obviously because they end up channeling the majority of rain water run off. Unqualified Contractors often “fix the leak” by covering the area with tar.